What's the difference between resolve(thenable) and resolve('non-thenable-object')? I was trying to understand the difference between resolve(thenable) and resolve('non-thenable-object'). In examples below, use promise instead of thenable because promise is also thenable and may be easier to understand. So, I checked the spec and found Promise Resolve Functions . Then got to PromiseResolveThenableJob and EnqueueJob. Perform EnqueueJob("PromiseJobs", PromiseResolveThenableJob, « promise, resolution, thenAction »). This Job uses the supplied thenable and its then method to resolve the given promise. This process must take place as a Job to ensure that the evaluation of the then method occurs after evaluation of any surrounding code has completed. If IsCallable(thenAction) is false, then Return FulfillPromise(promise, resolution). whether my logic is right? If not, how do you explain the different orders between resolve(thenable) and resolve(non-thenable) ? Yes, your logic looks right. 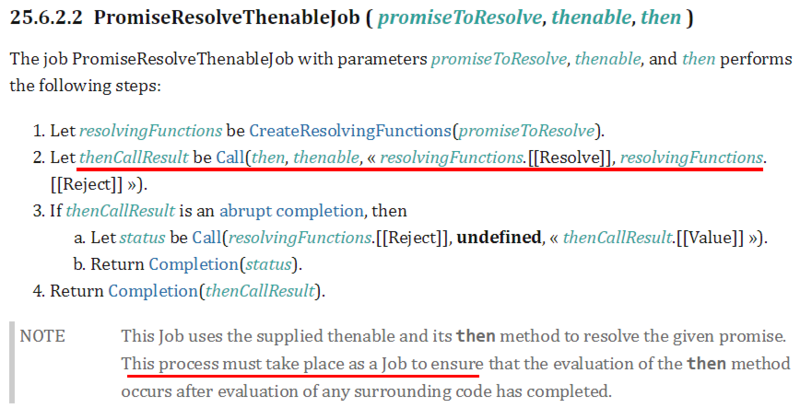 new Promise(resolve => resolve('non-thenable-object')) is equivalent to Promise.resolve('non-thenable-object') for all purposes. After reading the specification and testing many times I thought I might get it. Before we start, we have to settle something. Which got the same result as RESOLVE(thenable). Though, in this case, the order between RESOLVE(thenable) and RESOLVE(promise) is different. Because thenable.then is a sync operation while resolvedPromise.then is an async operation. They are not the same then method. It is quite simple when using Promise.resolve(promise) because it returns promise argument. However, things become complicated when using Promise.resolve(thenable) and the thenable is not a promise. Let's call it Promise.resolve(nonPromiseThenable). You can test it in the demo below. Promise.resolve('nonThenable') can be transformed into RESOLVE('nonThenable'). They have the same effects. Promise.resolve(thenable) is different from RESOLVE(thenable). They have different effects. What's the difference between using “let” and “var”? Why is null an object and what's the difference between null and undefined? What is the difference between call and apply? What's the difference between event.stopPropagation and event.preventDefault? What's the difference between tilde(~) and caret(^) in package.json?